FlossieBlossoms: Nag, nag, nag...... and a rant. Nag, nag, nag...... and a rant. So you're tired of looking at ornaments, eh? Fine, look at this instead while I listen to my husband shovel snow and call his idiot dog who has learned how to climb over our fence and took herself off for another romp in the woods, chasing deer and turkeys. I swear, she's worthless and I'm not getting any fonder of her the longer she's here. If someone has to tell me 20 times a day that she's a good dog, it makes me wonder who the heck he's trying to convince, me or himself? Yeah, she's good. Good at grabbing at you with her teeth, snapping at you when you reprimand her, good at climbing fences and standing up on her back legs with her front ones on the kitchen counter. She's good at climbing OVER the other dogs to be the first one out and she's good at shrieking for an hour if you let her. She can eat a bowl of food in about 4 seconds and then she just wants more. This dog has issues and I am not real happy with her here. She's disrupted the whole house and I wish he'd never had that chip put into her. I keep telling her if she runs off again, don't bother coming back. But she always does, dammit. I want to love this dog, but I don't. I love the other dogs and all of the cats, but this dog is a sociopath, just like his black dog that died a couple of years ago. It's the same dog in a different color. Not lovable. Annoying, stubborn and bullheaded. We both call her "him" all the time because there isn't anything feminine or dainty about Quigley. And Mr. Softie who usually has nothing but good to say about her is actually contemplating a shock collar. Like the remote for the TV, I want to hold onto the remote for a shock collar, too. Heh. OK, onto happier things that might convince you that I'm not really a monster- A mug rug for my partner in the swap. I made this yesterday and last nights snowfall made for a really pretty backdrop. This is the chair on my little balcony off the sewing room. I won't be sitting out there for a while! Hopefully my partner will like it. I think it turned out pretty cute. Red and aqua are so pretty together and such a popular color combo these days. On the back are a slew of little hedgehogs. Now I'm busy making more bitty blocks and contemplating what I shall make for my new partner in the doll quilt swap. I'm thinking of doing something in a rainbow village type setting. Like this- blue sky at the top, turning into purple mountains, a red/orange/yellow village and then greens at the bottom. All the colors of the rainbow. Hopefully I can pull it off. I'll probably do most of it with raw edged applique and just piece the turquoise stars in the sky. We'll see! At least I have an idea, that's a relief! hahaha...I think I know that dog!!! That such a pretty mug rug. I can't wait to see that mini quilt design all made up...that has awesome promise! You rant as much as you like, it's your blog! 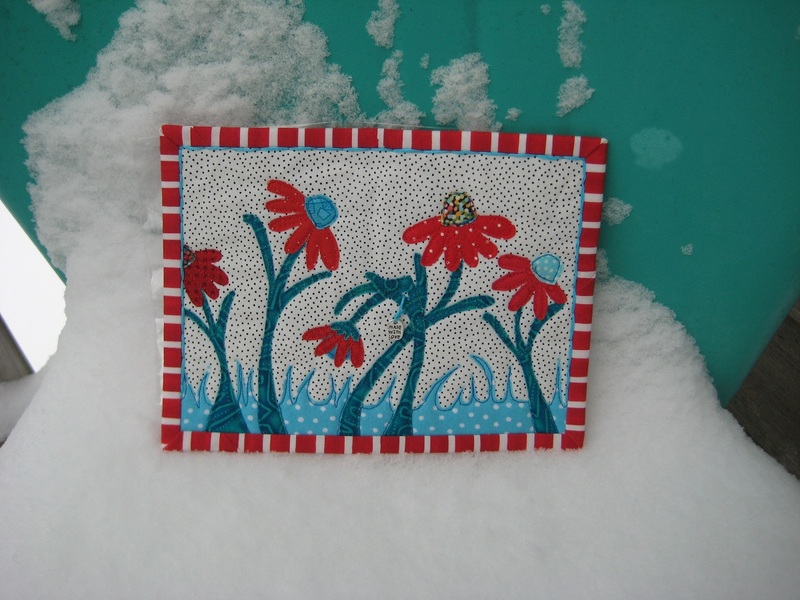 Very pretty mug rug and a really interesting DQS idea! You put the chip in her- you are screwed. You could take for a long drive in the woods and still have her come back. I'm just kidding. I'd call caesar right away. Get that dog a job. the puppy backpack is great because they carry it around and wears them out. Nothing worse for the household then a member who is not behaving whether they have fur or not. Your aqua chair is gorgeous, as is your mug rug! That's what I was going to say...the aqua chair is cool & your mug rug is pretty awesome. Your partner will love it! You or your husband could take the dog to obedience school and with good behavior, I bet you would learn to love it. Your mug rug is beautiful! And I do not judge you at all for wanting to put a shock collar on your dog. Some days, it seems like a good idea to put a shock collar on my KIDS! Remote Shock Collars are one of the most effective, easiest and most humane training aids available. Remote Shock Collars are placed on a dog's neck, allowing a trainer to deliver small static corrections of varying strength by remote control. The correction the dog gets from the remote dog training collar is no different than static from walking on carpet. The benefits of working with a remote dog training collar is the trainer can immediately correct a dog's mistakes at a distance far greater than leash training allows. A Shock Collar is a safe, effective and humane way to train your dog. I've known many dogs like that. I've had my share. I think the shock collar is a great way to train them, if you are willing to put out that amount of money for a worthless dog. sorry about the chip. Not all dogs are wonderful like some people seem to think. believe me, I lived next door to 9 dogs, count them NINE. None trained, but they all barked. a LOT. we used to own dogs, but after having nine next door, we got pretty soured on anything canine. So when ours died of natural deaths, we didn't replace them. attrition. Just found your blog through mamacjt. Your quilts look so darling.